The best country to live in is Finland. 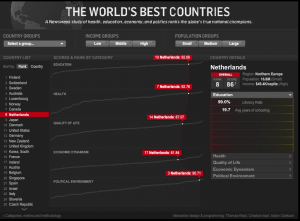 Newsweek created an interactive to compare the worlds top 100 nations on topics like health, education and economy. It’s a nice looking flash-app, but you can only compare two countries at a time. If you like to compare more – or you happen to live in one of the 90+ countries that are not in the list – you may be more interested in the website of the World Economic Forum. There you can create your own visualizations based on the results of the Global Competitiveness Report 2010-2011. A lot of data, very interactive, but not what you would call eye candy. Next year the WEF would be wise to hire Roland Loesslein who did a nice job on the United Nations Human Development Reports. ‹ Why a blog about interactives?